In the Name of the Father, and of the Son, and of the Holy Spirit, Amen! My beloved in the Lord, the great and saving time of the Fast is upon us! We have completed the time of preparation, beginning with the Sunday of Zacchaeus, and continuing with the Sundays of the Publican and the Pharisee, the Prodigal Son, the Sunday of the Last Judgment, and now finally with today - the Sunday which commemorates the expulsion of Adam from Paradise. Of course much can be, and indeed has been said about each preparatory Sunday—from the desire of Zacchaeus to the humble prayer of the publican to the repentance of the prodigal son, and finally with the clear teaching of the Lord as to what we need to do to inherit the Kingdom of Heaven. Today's theme, however is more frightening—the expulsion of Adam from Paradise. The stichera sung at last night's Vigil service were certainly a spiritual wake-up call for all of us. We heard of Adam weeping outside the gates of Paradise saying, "Woe is me…I transgressed one commandment of the Master, and now I am deprived of every blessing!" Also, during the matins canon we heard the words, "O miserable soul, thou hast departed far from God through thy carelessness; thou hast been deprived of the delight of Paradise and parted from the angels; thou hast been led down into corruption. How art thou fallen!" Not only are these words frightening for us, but also more importantly, they are true. 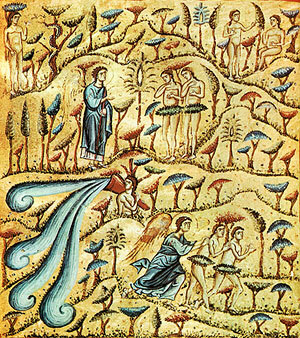 Nevertheless, the Holy Church, in Her mercy and love for us gives us comfort, even in the simple fact that this Sunday, although frightfully serious in it's theme of Adam's fall and in turn, our own sinfulness, has another, more consoling theme as well, and that is the theme of FORGIVENESS. On this Sunday, we are powerfully reminded that no one is so patient and so merciful as God, but even He does not forgive those who do not repent. And therefore, my beloved, we must constantly repent of our sins, both individually as well as communally. The Holy Church gives us a unique and marvelous opportunity to do this for the next 40 days, for again, I say to you, that the time of the Fast is here! Great Lent is indeed a holy time for us Christians and should be met with respect, love, and also very importantly with joy. Tonight at the vespers service we will pray the stikhera on "Lord, I call", "Let us begin the fast with joy!" This is crucial. Joy must be the mark of us as Christians. Today we heard in the Gospel reading, that if we forgive our brother his trespasses, our Heavenly Father would forgive us. Truly this phrase should bring joy to all of us, because if we think about it seriously we see that is indeed easy for us to be forgiven. All we need to do is to forgive our brother! Tonight the Holy Church makes this even easier, with the rite of forgiveness. We as a community of believers will bow before each other, and in so doing we bow before all humanity, and we ask for forgiveness of one another. We know that when we sin, we sin not only against God Himself, but also before all mankind. We also know that forgiving our brother is also an act of repentance, and therefore an act that leads to our salvation. There are those who sadly enough do not take advantage of this wonderful and indeed humbling experience, and I must say that they suffer because of it. We must clearly understand that there can be no true fast, no genuine repentance, no reconciliation with God, unless we are at the same time reconciled with one another. As one bishop of our Church said in a commentary on the Lenten Triodion, "A fast without mutual love is the fast of demons" and also, " Our asceticism and fasting should not separate us from our fellow men but link us to them with ever stronger bonds. The Lenten ascetic is called to be a man for others." The first step in becoming "a man for others" is to forgive the "other". In today's Epistle reading, the Holy Apostle Paul instructs, "Who are you to pass judgment on servants of another? It is before their own lord that they stand or fall. And they will be upheld, for the Lord is able to make them stand (Rom.14: 4). Later, in the same Epistle to the Romans, he says, "Let us therefore no longer pass judgment on one another, but resolve instead never to put a stumbling block or hindrance in the way of another. (14:13)" and also, "we who are strong ought to put up with the failings of the weak, and not to please ourselves"(15:1), and again, "welcome one another, therefore, just as Christ has welcomed you, for the glory of God"(15:7). This is what tonight's service of reconciliation is all about, my beloved, and indeed it is what all of Great Lent is about, and actually, I must say, it is what our entire life as Christians is about - being reconciled to one another, through Jesus Christ, our Lord. And by so doing, we become united to Christ Himself. Obviously, as fallen people, living in a fallen world we sin against one another, however, we must realize that we must immediately forgive our brother when he sins against us, and we must also immediately ask forgiveness of him when we sin against him. Our Father among the Saints, the righteous John of Krondstadt is quoted as saying, "Imagine, picture the multitude of your sins and imagine how tolerant of them is the Master of your life, while you are unwilling to forgive your neighbor even the smallest offense. Moan and bewail your foolishness, and that obstruction within you will vanish like smoke, you will think more clearly, your heart will grow calm, and through this you will learn goodness, as if not you yourself had heard the reproaches and indignities, but some other person entirely, or a shadow of yourself." (Lessons on a Life of Grace) Following these instructions of the great Pastor of Russia, Saint John, will indeed bring us joy, the joy that comes from above. The joy that comes from knowing that our sins will be forgiven, if we forgive the sins of our neighbor, as was promised us in today's Gospel reading. It will be this very joy that gives us the strength to continue our efforts throughout the time of the Fast. We know that with the season of the Fast comes many and great temptations. We must joyfully persevere in the face of these temptations, knowing that if we pray sincerely, and give them back to God, they will pass, and with His help, we will become victorious. It is precisely in the face of temptation that we can and must cry out to God the words of tonight's prokeimenon, "turn not away Thy face from Thy child for I am afflicted; hear me speedily, draw near unto my soul and deliver it!" And He will do this for us, my beloved; He will do this indeed. We know the fasting rules of the Church, (if we don't, then let us ask the priests to instruct us), we know that the Lenten services will be longer and more intense, we know that there will be prostrations to do, tears to shed, and prayers to offer during this time. We know that the whole Church will be immersed in repentance in a uniquely clear and vivid way. Our vestments will be darker than usual, our melodies will take on a repentant tone, and indeed we will feel that the time is different. We will be immersed in some kind of darkness and sadness. However, as one priest stated, it is a "bright sadness" that we will have during the Lenten period, for we know what awaits us when the 40 days are finished. Nevertheless, that comes later, for now we must concentrate on what is before us, namely forgiving our neighbor, intensifying our prayers and our fasting in order to purify ourselves for the coming Feast of Feasts, the Pascha of our Lord. In closing, let me again share with you the words of one of tonight's stikhera, "Let us begin the fast with joy! Let us prepare ourselves for spiritual efforts! Let us cleanse our soul and cleanse our flesh! Let us abstain from every passion as we abstain from food! Let us rejoice in virtues of the spirit and fulfill them in love! That we all may see the passion of Christ our God, and rejoice in spirit at the holy Pascha!" At the onset of Great Lent and a period of intense fasting, this Sunday reminds us of our need for God’s forgiveness and guides our hearts, minds, and spiritual efforts on returning to Him in repentance.